Above: The design of the 1927 UT senior ring. The Bachelor of Arts degree is displayed in its Latin form as Artium Baccalaureaus, or “AB.” Click on the image for a larger view. Rings have been a part of university culture for centuries, dating back to the 1200s when the University of Bologna presented gold rings to students who had completed their doctor’s degrees and earned their licentia docendi, or “licenses to teach.” The practice continues at a few universities in Europe. The idea of a class ring began with the United States Military Academy, when the Senior Cadets of 1835 designed and wore a common ring as a show of class unity and to remind them of their West Point days after graduation. At the University of Texas, the senior ring tradition arrived early in the spring of 1927, when the senior class voted to have one and solicited designs from fellow students. By mid-February, the class had chosen the entry from Amy Jackson, a student who worked part-time as a technician in the zoology department. Made of 10-carat gold and with a red garnet stone, orders could be placed at the University Co-op; men’s rings cost $13 each, co-ed rings were $10.50. Sales were sluggish at first. By mid-March, only 26 rings had been purchased. But when the UT Students’ Assembly (today’s Student Government) approved the design as the “official” senior ring of the University for future years, interest grew swiftly. Rings ordered by April 20th were ready in time for spring commencement in early June. “One one shank appears a Longhorn head with a lariat draped from one horn around under the nose and up to the other horn. The number ’27’ is just above the head, and a lone star is just below the nose. In a semi-circled wreath below the star is a group of Texas cacti. 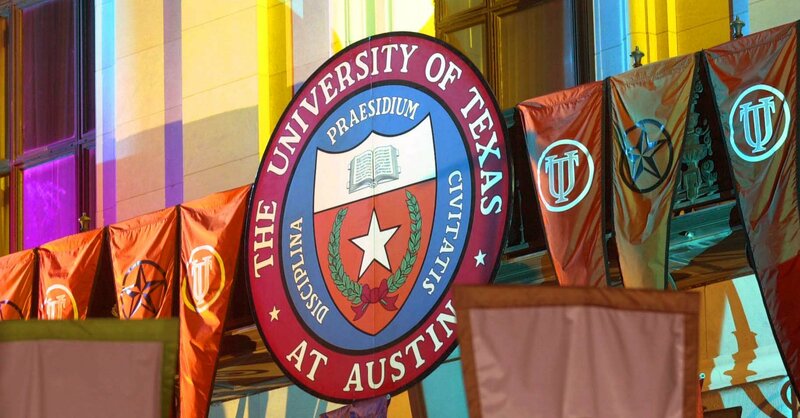 Above: The University of Texas Seal, with its Latin motto, is prominent at Spring Commencement and an important symbol on the senior ring. I love this design and would love to have a replica for my “overdue” senior ring. Thanks so much, Jim. My father had just this ring, only instead of the garnet his had the seal of The University in gold.